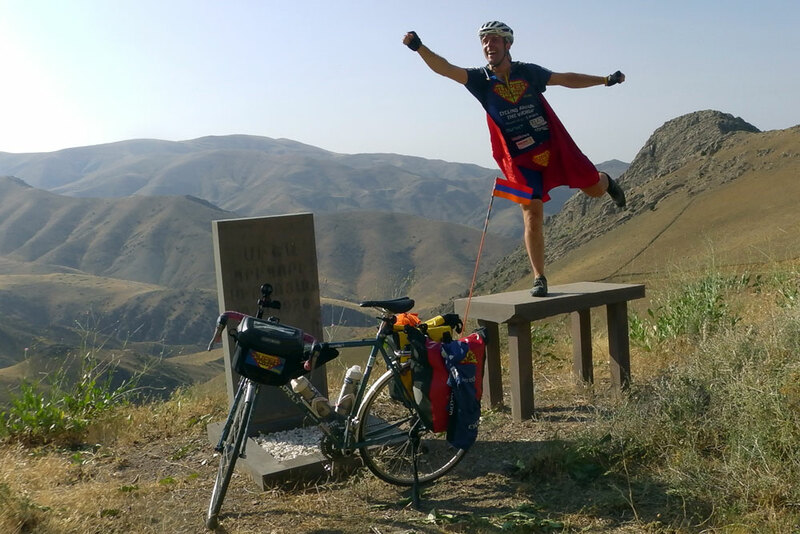 A cyclist dressed as Superman is a hundredth of the way into a five year, 100,000km ride around each of the world’s seven continents. Will Hodson, 38, set off from his Putney home on Saturday, May 30, as he extends his annual cycling holidays into a continuous half-a-decade journey. The former primary school teacher, who has given himself the moniker Super Cycling Man due to his daily attire, is hoping to raise more than £100,000 for The World Cancer Research Fund, Parkinson’s UK, World Bicycle Relief and the cycling charity Sustrans. Hodson is updating his whereabouts and uploading his day’s riding on Strava. “I have previously travelled the world in chunks by riding in the summer but the trouble was I didn’t want to stop,” he told Cycling Weekly. Speaking from his current location of Brussels, 1,000km complete, he explained how he has was invited to stay with a Belgian pop star called Raymond, and how his novelty clothing is negotiating him an extra couple of inches space. The sight of the Tour de France peloton snaking up Alpe d’Huez this July will undoubtedly become one the year’s most iconic images. But swap the prestige for humour and Hodson could claim to be 2015’s greatest ascender of the 21 hairpins. To donate to Super Cycling Man visit his fundraising website.